There are a variety of reasons in which people wear compression socks or compression stockings. These heavy-duty socks are worn for comfort and can be used in the sporting world to improve athletic ability and promote rehabilitation. For others, they’re used to prevent certain medical conditions. The compression stocking itself is made out of a strong, elasticized hose and comes in a variety of lengths, sizes, and strengths depending on the purpose of its use. The goal of compression socks is to apply pressure to the lower extremity. In doing so, it improves blood circulation, helps with edema (swelling) and decreases pain. With certain medical conditions, you can experience lower extremity fatigue, itching, burning, and cramping, all of which also can be improved by these handy, medical grade stockings. Medical grade compression socks come in a different grade of strengths, depending on the degree of pressure needed. For most, the sock needs to be tighter around the ankle and then decreases in compression up towards the knee or thigh, depending on length. Depending on the individual’s condition, the length and strength will be prescribed by your medical doctor and can be customized by taking measurements. The compression sock can then be purchased at most medical supply stores, ordered online or through your healthcare providers office. For athletes, compression socks can be purchased at the local sporting goods stores. Whether the purpose of the compression sock is for sport or is considered medically necessary for a specific health condition, the purpose of the stocking is the same: to promote circulation, prevent swelling and ease discomfort and fatigue. Medicare Part A and Medicare Part B covers most medical conditions, treatment options, and durable medical equipment. And while Traditional Medicare benefits cover a lot, they don’t cover everything. 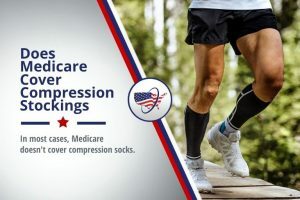 Unfortunately, standard compression socks are one of those items not covered by Medicare, regardless of the medical condition in which it’s being used for. In some cases, Medicare will cover certain “specialized” types of compression stockings for very specific medical conditions. If you’ve been prescribed graduated compression stockings for open venous stasis ulcers, Medicare can consider it a type of “wound dressing” and therefore the Part B benefits may pick up coverage. Additionally, Medicare may cover a lymphedema pump, which also promotes blood circulation and prevents edema and other medical conditions in the lower extremities. However, lymphedema pumps are a rather cumbersome device and unlike compression socks, are less convenient and cannot be worn underneath the clothing. To find out what medical devices are covered, either talk to your healthcare provider or call your insurance carrier. They can provide a complete list of medical conditions and treatment options available to you under your Traditional Medicare benefits. What Conditions do Compression Socks Treat? For those suffering from lower extremity pain, fatigue and edema, compression socks are an excellent option in treating symptoms caused by certain medical conditions. Diabetes – for individuals suffering from diabetes comes poor circulation. With poor circulation, one can suffer from a burning (numbness and tingling) sensation as well as diabetic ulcers. Compression socks can help with the burning sensation and also prevent diabetic foot ulcers. Deep Vein Thrombosis (DVT) – are blood clots that form deep inside the veins formed from poor circulation. DVT’s are dangerous as the blood clots can break off and travel to the lungs causing a pulmonary embolism which in some cases can lead to death. Compression stockings help increase the blood flow and decrease the swelling in the legs. Primarily, with DVT’s, compression socks prevent the blood from pooling in the legs further causing more clots. Chronic venous insufficiency such as Varicose Veins – varicose veins occur when the vein becomes enlarged and filled with blood causing the vein to appear bluish and raised. Compression socks add pressure to the veins in the feet and legs, thus improving the circulation in the affected veins. Sleep Apnea – during a new and recent study with Reuters Health, sleep apnea (a condition in which you stop breathing during sleep because the airway becomes narrowed or blocked) patients that worse compression stockings for 2 weeks, saw the frequency of their apnea decrease. Post-partum edema – ankle and leg swelling after pregnancy has been proven to be decreased after giving birth by wearing compression socks. There are a variety of other medical conditions that can be prevented or treated with compression socks. Talk to your medical provider to see how compression socks may benefit you. According to an article from the Vein Specialist of the South, compression stockings aren’t just for grandmas! New and improved compression stockings come in many fashionable designs. So while your compression stockings are serving a medical purpose, they can very much so, be snazzy! “New fabric designs have revolutionized the compression market. While compression socks aren’t covered by Traditional Medicare, many durable medical equipment suppliers are. Medicare Part B only covers at 80% which means the Medicare beneficiary is responsible for the remaining 20%. For most seniors, any additional monthly cost, especially that 20% coinsurance that adds up, is a big deal due to their fixed incomes. Seniors, we can help! A Medicare Supplement Plan works with your Traditional Medicare benefits and provides additional medical coverage. Items like copayments, coinsurance, deductibles and other healthcare costs that aren’t normally covered with Traditional Medicare can be covered. Medicare Supplement Plans can help seniors save money and peace of mind. Call us today, or go here for an online for rate comparison. Saving money on healthcare costs has never been easier, so let us help!